1st Lt Anton H. Edburg, Jr.
14 Nov 2015: Added: Wolski to Cew Honor Roll. 18 May 2015: Added: Van Schuyler to Cew Honor Roll. 7 May 2008: Added: Leckron to Cew Honor Roll. Final Flight confirmed by niece. 27 March 2008: Added: Edburg to the Crew Honor Roll - his name found on the SSDI. Captain Van Schuyler and his crew got together and trained in Cuba and Salinas, Kansas. Captain Van was a veteran pilot compared to most war time standards. He received his pilot license at age 16 and had flown as an instructor pilot in the Canadian Air Service for several years prior to returning to the United States. At that time, he was about 33 years old. When the crew flew out of Salina to staging at Harrington, they were instructed to get in to flight formation, fly over Smoky Hill and maintain said formation until they passed over Harrington. Capt Van was the group leader on that show. The flight to Sacramento, Hawaii, Kwajalein and Guam was routine. The men knew things were getting serious while on Kwajalein the armors there loaded and checked all of our guns. They were to fly within sight of Truk, which was occupied by the Japanese. They did see the island of Truk but no Zeros came out to greet them. They landed on North Field 31 March 1945. Crew 54 flew their first mission by mid April. In all the crew would fly 33 sorties all successful. There were no aborts and no emergency landings. Phil is still flying as of 1995. He has his own plane, a twin Commanche PA-30. He is also flying for a local banking chain in Boise, Idaho. Loren Abell and Phil Van Schuyler got together in Sacramento in 1995. They had a nice 3-hour visit at the Nut Tree near Vacaville, California. Each was brought up to date on many incidents they had forgotten. They reviewed old photos; they remembered the faces but could not recall many of the names or crew numbers. 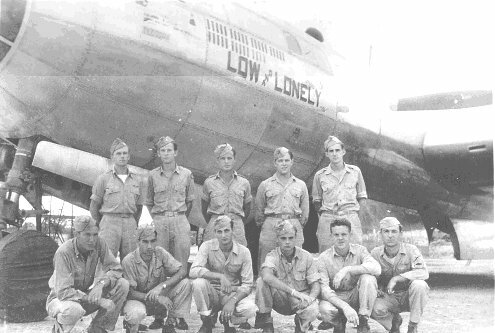 Source: Submitted by Phil Vamschuyler for "History of the 39th Bomb Group"